This small-footprint home is designed with family-living in mind. 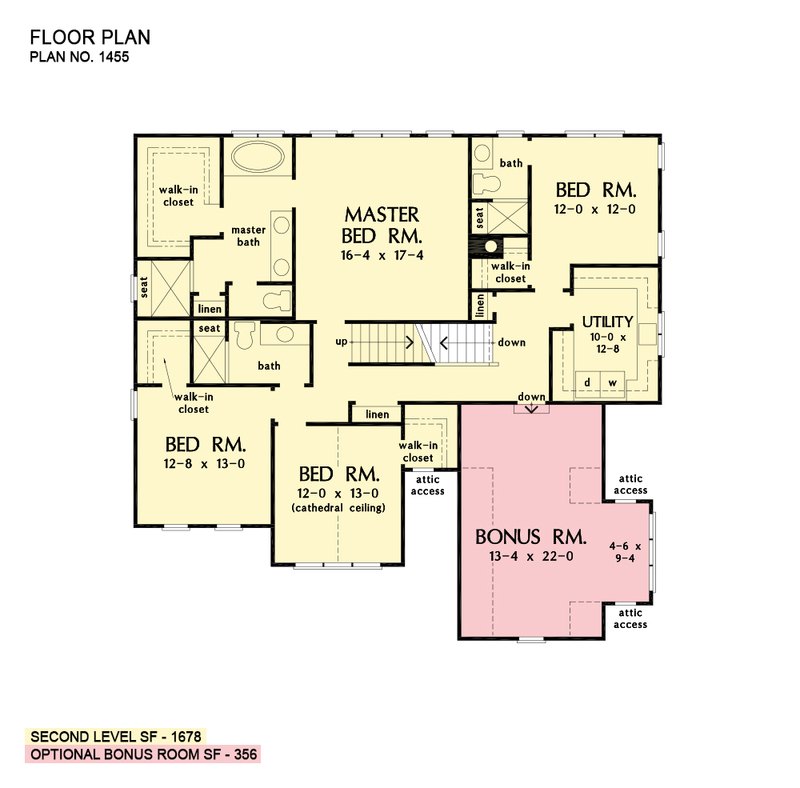 The master suite and three bedrooms are upstairs, with an oversized utility room nearby. A bonus attic is above with an abundance of space for a theater or game room. The main floor is thoughtfully arranged with an island kitchen that accesses a butler's pantry and storage pantry on the way to the dining room. Cozy and inviting, the great room offers a fireplace, coffered ceiling, and entry to the rear porch. A bedroom/study is perfect for a guest suite or office and a mud room is ideal for dropping bags and coats. 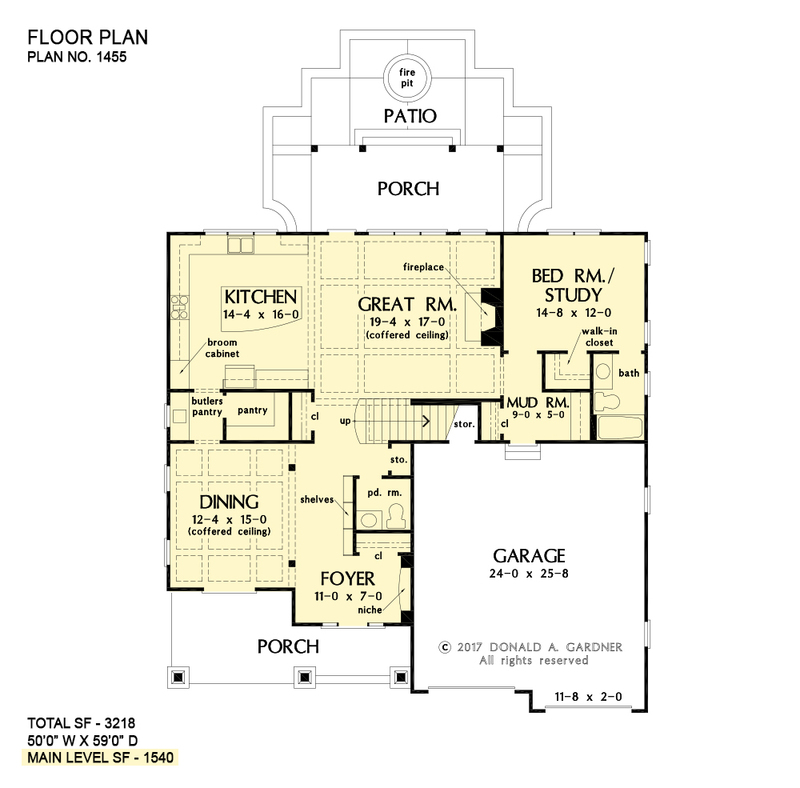 2nd Floor: 1678 Sq. Ft. 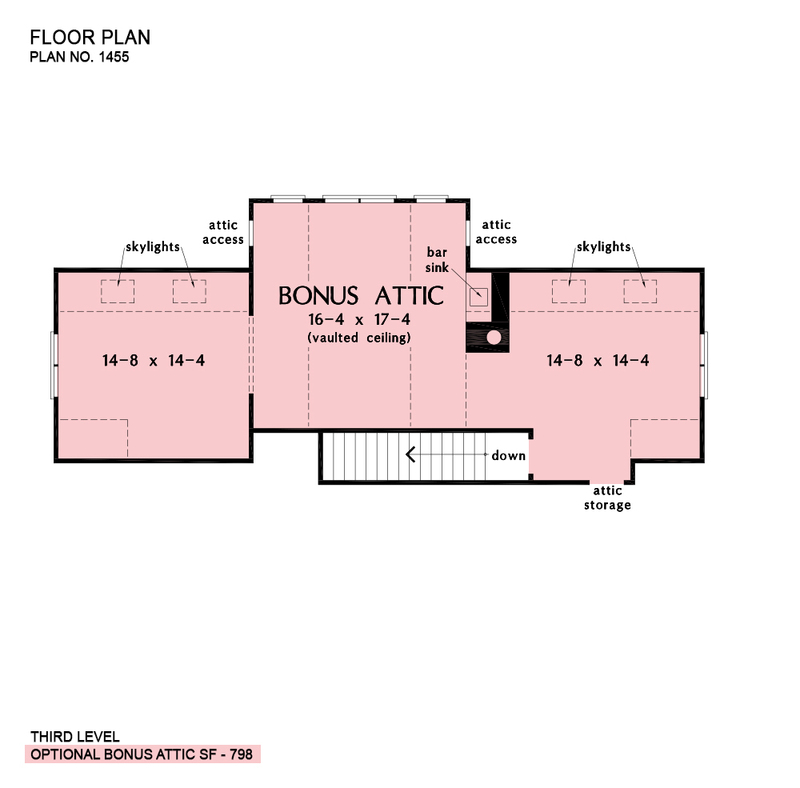 Bonus Attic: 798 Sq. Ft.
Porch - Front: 196 Sq. Ft.
House Dimensions: 50' 0" x 59' 0"
Great Room: 19' 4" x 17' 0"
Master Bedroom: 16' 4" x 17' 4"
Foyer (Flat): 11' 0" x 7' 0" x 10' 0"
Dining Room (Coffered): 12' 4" x 15' 0" x 10' 0"
Great Room (Coffered): 19' 4" x 17' 0" x 10' 0"
Kitchen (Flat): 14' 4" x 16' 0" x 10' 0"
Utility Room (Flat): 10' 0" x 12' 8" x 9' 0"
Bonus Room (Clipped): 13' 4" x 22' 0" x 8' 0"
Garage (Flat): 24' 0" x 25' 8" x 0' 0"
Garage Storage (Clipped): 6' 8" x 3' 8" x 0' 0"
Master Bedroom (Flat): 16' 4" x 17' 4" x 9' 0"
Bedroom / Study (Flat): 14' 8" x 12' 0" x 10' 0"
Bedroom #3 (Flat): 12' 8" x 13' 0" x 9' 0"
Bedroom #4 (Cathedral): 12' 0" x 13' 0" x 12' 0"
Porch - Front (Flat): 12' 4" x 5' 2" x 9' 0"
Porch - Rear (Flat): 20' 0" x 9' 0" x 9' 0"
Deck / Patio (None): 30' 0" x 21' 0" x 0' 0"
Mud Room (Flat): 9' 0" x 5' 0" x 10' 0"
Bedroom #5 (Flat): 12' 0" x 12' 0" x 9' 0"
Storage (1st Fl.) (Flat): 2' 0" x 3' 4" x 10' 0"
Bonus Attic (Vaulted): 16' 4" x 17' 4" x 12' 0"